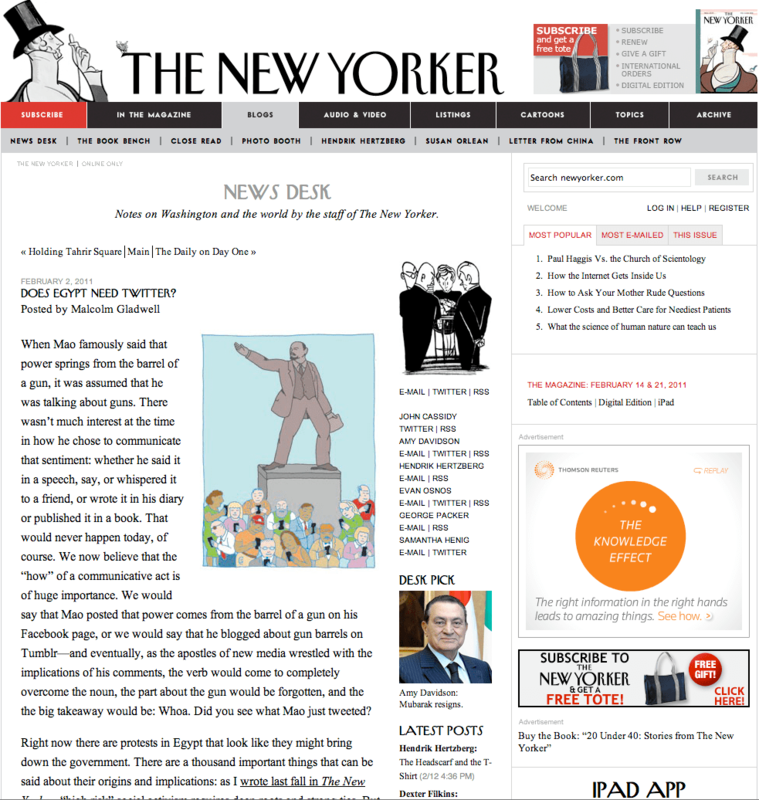 Malcolm Gladwell’s latest critique of social networking sparked an energetic response in the social networking-o-sphere, just as his October article did. And his critics are largely right. Yup, he is missing the point that weak tie relationships can become strong tie relationships. Indeed, he seems to misunderstand the relevance of decentralized control over the production of media and the distribution of information. But I think his ongoing critique of social networking does (obliquely) illuminate the biggest weakness in the social-media-for-advocacy universe: the lack of clarity about the mechanisms of change underlying the use of social networking tools. This might be true in the most general of ways, but it’s not very useful for crafting an effective outcome-oriented strategy, especially if you are working with limited resources (i.e., nearly always). It may be that the most effective strategy really does amount to igniting high-volume protests. Kanter’s impressive effort to pressure Apple into making nonprofit donation tools available on the iPhone might fit into this model. Get enough people talking enough about it and you might be able to leverage some high-profile media coverage. And you might then be able to leverage the coverage into effective market pressure. But if I’m trying to persuade my City Council to adopt historic neighborhood protections, thousands of Facebook messages from people who don’t live in my town probably isn’t going to be very effective (in fact, they might even have the opposite effect, since what elected representative wants to look like they are responding to pressure from outside their community?). The most effective voices may be the residents and property owners in those specific neighborhoods, so the winning strategy may really be about persuading a very small number of people to get involved in very direct ways. If you want to persuade the Member of Congress from western Colorado (whomever it might be at the time) to support a wilderness bill, direct expressions of support from a small number of Colorado opinion leaders among ranching and farming constituencies are likely to be much more effective than a large number of comments from across Colorado and the country. The savvier social networking evangelists in the nonprofit world do a good job of highlighting the importance of having clear goals before launching a social networking strategy. Clarity about whether you are more focused on reach or on high levels of engagement, for instance, will have a significant impact on what you do. The next step, though, is to extend that sort of thinking a few steps further back: exactly what social change or community value outcomes are you aiming for, what exactly needs to happen to accomplish those goals, and then how exactly can a social networking strategy help you get there. There’s no one right way to do this. A campaign-focused organizing strategy that identifies the individual decision-makers of consequence can work well, just as the more abstract “theory of change” or “logic model” approach that some funders emphasize. But absent some clear understanding of what must happen, exactly, to produce the targeted outcomes, then social networking may or may not have any meaningful impact. And I think it’s safe to say that it won’t have as much impact as it could. The main value of Gladwell’s continued critique (which has, ironically, been propelled far more widely because of social media than it would have been otherwise) has been to catalyze a reinvigorated discussion about the value of social networking in social movements. Perhaps it will also help drive a touch more rigor in our thinking about how to use these tools most effectively.